Red belly tuna in sea vegetables tartar. Belly tuna Ventresca 200 gr. Fresh peeled and grated ginger 3 gr. Lime juice (natural) 8.5 ml. Extra virgin olive oil 35 ml. Seaside arrowgrass “junquillo de mar” 2 gr. Ficoide glacial (crystalline ice plant) 8 gr. Moss of Ireland 4 gr. Salicornia (sea beans) 6 gr. 1. Clean the belly tuna belly and cut into big dices. 2. Chop in 1/2 cm dice with a sharp knife. 3. Store in the refrigerator covered with plastic wrap until its use. 1. Grind the garlic, ginger, wasabi, galangal and lime zest in a blender. 2. Add the lime juice and the rice vinegar until you get a homogeneous cream. 3. Incorporate the extra virgin olive oil into fine strip until an emulsion is obtained. 4. Drain and save cold. 1. Clean the salicornia and keep the yolks. 2. Cut the Seaside arrowgrass in 3-centimeter canes. 3. Select the leaves and shoots ficoide glacial. 4. Choose Ireland moss in small bouquets. 1.Place the almonds, split in half lengthwise and keep until serve. 2. Make a cut on the stem of the onions and remove the layers carefully with the help of a small knife. 1. Season the tuna belly in a bowl and stir with a spoon. 2. Add the maceration and mix so that it is evenly distributed. 3. In the center of the dish, place the tuna and shape it with a 8 centimeters round mold. 4. Put the tuna and sea vegetables randomly. 5. Finish the dish by placing the hollow pickled onions and the tender almond. For a tasting menu we will put 30 gr. of tuna belly chopped for 10gr. of maceration. 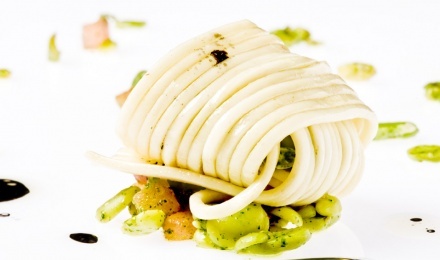 Fresh pasta with broad bean and baby cuttlefish salad. 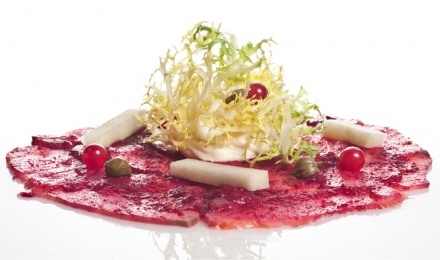 Salmon carpaccio marinated in beet, salad and vinaigrette. 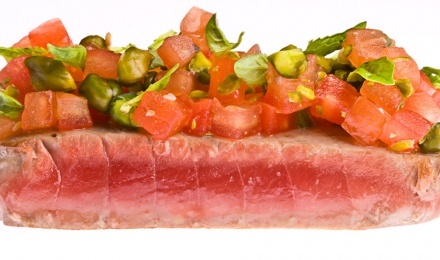 Tuna belly with tomato and pistachios.